Whether it’s in summer or winter, cleaning the outside of a house or other outdoor areas always consumes a lot of time. If you are struggling with these chores, do not hesitate any longer and read the following review of the best home pressure washer. A pressure washer is a device combining an air compressor and a hose. Powered by a gas engine or an electric motor, a typical unit pushes water through a trigger or spray gun at high pressure. You even can add detergent to wash hard dirt and areas, which makes it more useful. Pressure washers have become a preferred device for most households because of the following astounding benefits! With a pressure washer, you don’t need to waste time cleaning your house by hand and leaning precariously over the ladder. No matter which the building material is, you can use a pressure washer to clean it. Just plug in or add fuel and start cleaning with detergent. Easy, right? Your house’s exterior will be clean and cleared. You can also use a pressure washer for cleaning surfaces. It is surprisingly helpful when preparing to paint something. Your painting layer will be more durable. A pressure washer can make your work of washing your vehicle lighter and easier. You can spray your favorite detergent and then clean it with water. You can even clean the bottom of your car once changing the water streams, the angle and the force of the spray. Insects sometimes set up their nests around your house, making it look dirty. For wasp nests, it is not easy to remove. But! A pressure washer is your solution. It is a safe way to get rid of spider webs and wasp nests. To be more careful, remember to spray wasp at night, while bees are sleeping. No one wants to swim in the winter. Your swimming pool certainly has a lot of dirt and the build-up of mold on the surface after this season. With a pressure washer, these dust are not worth worrying about any longer. There are many types of pressure washer for various purposes. With heavy-duty jobs, gas-engine models with high GPM and PSI might give you more efficiency. And if you do some residential and light-duty cleaning, a pressure washer with medium GPM and PSI is enough. What are GPM and PSI? GPM (Gallons per minute): it is the number of water gallons which the machine can direct into the trigger or spray per minute. Models with the range from 1 to 4 of GPM are sufficient for residential cleaning. And the models with GPM up to 10 are for heavy-duty jobs. PSI (Pounds per square inch): This indicator measures the amount of outward water pressure generated. The more PSI is, the more effective you have when cleaning dust or mold. PSI from 500 to 4000 is suitable for home cleaning. For a commercial job, you need up to 7000 PSI. So, a model with GPM from 1 to 4 and up to 4000 PSI will be perfect for home cleaning. It can solve all cleaning duties around your house and still be easy enough to use. Besides, electric power might be more convenient than gas-engine. It not only saves fuel, but it is also easy-to-use. Too many things to consider? By reading the following review, you might have some options for your choice. 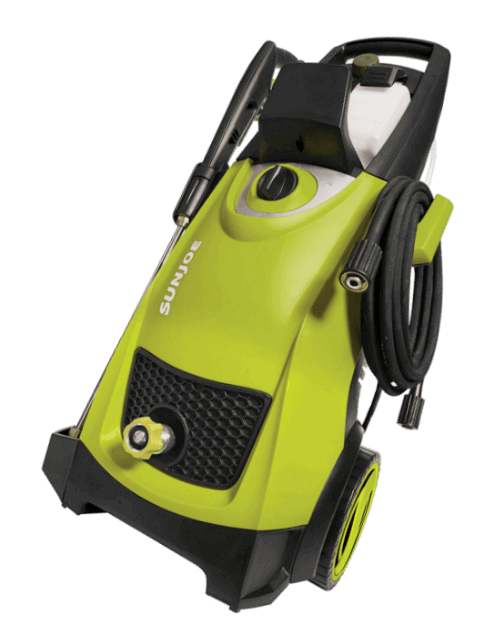 The Sun Joe SPX3000 is an ideal device for all residential cleaning jobs. With 1.76 GPM and 2030 PSI, this unit can provide the power to clean many types of surfaces and areas. Walls, floor and even some hard to reach places like guttering will not be a problem. Surface with oil stains is not easy to clean. However, the device has dual detergent tanks, and this feature makes cleaning these stain easier than ever. These removable tanks can store different types of detergent. And you can add favorite flavors for pleasant smells. What I like most about this machine is the TSS (Total Stop System). When you do not press the trigger, TSS will automatically shut off the engine, which saves energy and prolongs the pump life. In a jiff, you can change the water pressure from a gentle spray to an intense jet with the five quick-connect spray nozzles. It will be incomplete if we don’t mention the Sun Joe SPX3000’s compact design. With a rectangular body and big wheels, this model is easy to stand as well as move to another place. The plastic hose connector is one weak point of this model. The manufacturer has known that problem and will fix it by providing a steel hose connector when customer orders. So, before ordering this device, remember to request a steel hose connector. Would you like a light-weight, yet can provide powerful pressure, cleaner? The AR Blue Clean is undoubtedly a perfect home pressure washer for your choice. It is one product of the Annovi Reverberi brand, one of the highest quality lines of the pressure washer. 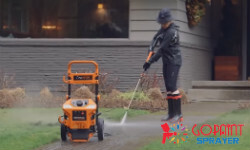 With the 1900 PSI and 1.5 GPM, the device can do light-duties and regular chores, such as washing vehicles, outdoor furniture, walls, and patios, etc. Only 27 pounds for the weight! As a result, this model will be a favorite washer for every woman. My grandmother has been using this machine since 2015, and she couldn’t be happier. Sometimes, she even washes bird cages with it for relaxation. The device also has an innovative safety feature, the “Total Stop System.” When the motor is overheating, it will automatically stop. If you want to buy it for the elder, don’t forget to read the instructions and explain it for them because the directions of this machine are confusing a bit. Although this model might be not suitable for commercial cleaning jobs, it is still ideal for home cleaning. I am sure that this Greenworks Pressure Washer will satisfy every demand of cleaning around the house. This model is only 1500 PSI and 1.2 GPM so we should not expect it to be as powerful as big gas-engine pressure water. However, it is powerful enough to clean patio pavers, yards, gates, and fences, etc. Accessories coming with the device are hose, gun, two nozzles, and a bottle. All of them are easy to put together and very useful. What makes it impressive is its lightweight, so you can carry by hand to anywhere you want. Its electric cord is long, making it helpful if you want to clean the distant areas. Its price is very reasonable, which is one of its advantages. There are some problems when using this pressure washer model. The screw where you put the hose will leak if you are not careful. The long electric cord might be helpful, but it also might cause trouble. You must wind it up around the wand, which sticks in the back because it has no more room for the high-pressure hose. We also have to store the hose separately. We always want to have an integrated pressure washer, a real work hose. So, let’s choose the Flagup 3000 PSI Electric Pressure Washer. Getting rid of dirt, grime, oil, rust, etc. on every surface is not troublesome any longer. With 3000 PSI and 1.8 SPM, this unit will meet all demands from residential jobs to commercial cleaning works. Five interchangeable nozzles are solutions for all types of duty, whether it’s light, medium or heavy cleaning tasks. The air-cooled industrial motor and TTS (Total Stop System) help it be safer when using the machine. When you’re not pushing the trigger, they will automatically shut off the pumps. It is also an excellent way to save energy and prolong the life of the machine. At first look, you can think it is noisy and challenging to use. But, it is not true. This unit is not only simple to set up, but it is also rather quiet. What I don’t like about this model is its hose. It might be so short that we have to pull it around like a suitcase when we want to wash the car. To sum up, this device works surprisingly well and is worth every dollar. Another product of the Sun Joe brand. The Sun Joe SPX4000 Electric Pressure Washer tackles your most challenging home and cleaning tasks with ease. The Sun Joe SPX4000 has the PSI up to 2030 and 1.76 GPM, which is undoubtedly more powerful than the SPX3000 unit. That’s why many people like this model. With the design like a cart, you can pull this model around without tipping over. The materials are of high quality and durable while the price still is somewhat reasonable. The detergent tank and different nozzles are fantastic features, too. What I like most from the Sun Joe SPX4000 is its handle, which is very sturdy and easy to remove for storage. Every cleaning task from light to heavy duty is not difficult for this machine. You should buy the oscillating attachment of the manufacturer because the machine might get not enough pressure without it. One thing you should consider before buying any product of the Sun Joe brand is that a Sun Joe Washer only can use the products and accessories from this brand. It means that you are locked into Sun Joe products if you buy this. Many people say the Schafter ST8’s performance makes them impressed at the first use. This model has sufficient features for a good pressure washer such as TSS (Total Stop System), interchangeable nozzles, pressurized hose reel. It is undoubtedly a multi-functional machine, which is an ideal high pressuring cleaning solution for all types of dirt, vehicles, and furniture. It is a real horse work owing to the PSI 3000 and 1.8 GPM, and all cleaning and washing jobs will become ease with it. Along with the machine, there are many accessories suitable for all needs. At first look, you think it is too big for you to pull around, don’t you? With the big wheels and hand pull, you can move it conveniently. Also, the item weight is only about 22.4 pounds. It is lighter than some usual pressure washers. But it takes a few minutes for all the air to get out of the lines before the full power comes through. Also, be cautioned that the time of the motor turning back to the full power after having released the trigger is longer than that of some other devices. Overall, the Schafter Pressure Washer still performs surprisingly excellent for both the household cleaning and commercial tasks. If you are looking for a small unit for household cleaning, the Stanley SHP2000 is also another remarkable compact pressure washer for your choice. Regarding functionality, we cannot compare Stanley SHP2150 to an industrial machine, but we can still use it for the usual cleaning tasks around the house. The placement of the power cord and the hose reel of this device is its advantages. We only need plug and start cleaning within a few seconds. And it only takes about 2-3 minutes to put it in to store. With the large water nozzle gun, which is such a neat feature, we can clean anything of any size. The design looks like a suitcase-style package, so we can pull and move it to anywhere we want. A disadvantage of this model is that it is too easy to tip over. The model might fall for several times if you do not get used to its long nozzle arm. To sum up, I am sure to say that Stanley SHP2000 is a high-pressure washer with a compact design that still performs well. We highly recommend if you want to use a pressure washer for cleaning the house every day. I am sure that Karcher K2 is one of the best home pressure washers nowadays. It has a surprisingly powerful in a small, well-designed package. The device is perfect for cleaning large areas of patio, decking and block paving. Its telescopic handle and storage for the powerful gun, hose, lances, and cable are for onboard. Despite being a small unit with a carrying handle and a pull up handle for wheeling along, it is more stable than other models with the same size. This device is so light that you should lift it, not wheel it around. As a result, I suggest that you should leave off the larger pull-up handle. I have been using a Karcher K2 for two years. And I am pleased how well it performs while quickly lifting the majority of dirt off the large places. Overall, for the average home where the demand is light – car washing, annual patio cleaning – this device is perfect as it delivers all the cleaning power you need. I give it five stars for the quality. I know that keeping a pressure washer is not simple. You should be careful before, during and after using to prolong the device life. Before owning a pressure washer, at least, it is essential that you should read and understand the above notes. It will be more durable and become a real work hose. Which is My Favorite Home Pressure Washer? Karcher K2 Full Control Home Pressure Washer! My favorite is the Kärcher pressure washer. It meets all my demands for cleaning and washing, is powerful meanwhile still light enough to carry by hand. The model also has many other great features, making you love it at first sight such as the compact design, accessories, etc. Provided that you need a versatile product, I suggest that you should try this unit. Or at least, let it be one of your choices when considering buying a pressure washer. We wish that the above review of the best home pressure washer might be helpful for you. Thanks to it you might have more information or an idea to own a suitable model. Last but not least, don’t hesitate to like and share the article if you think it’s useful.